Mukta (Moti) Pishti or bhasma (Pearl Calcium) is an important ayurvedic medicine. It reduces heat in the body and brings coolness in digestive system. It balances acid secretion, so it is a crucial part of ayurvedic management of gastritis and acid dyspepsia. 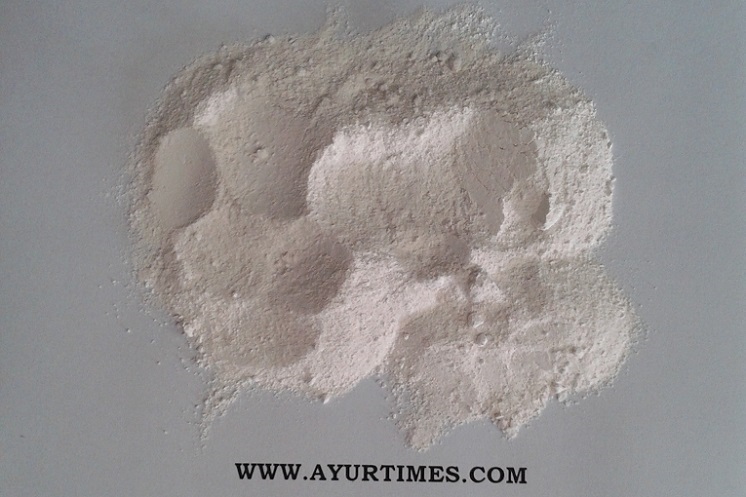 Two types of formulation are available in the market. Mukta Pishti or Moti Pishti: It is made by processing and grinding pearl fine powder with rose water. Mukta Bhasma or Moti Bhasma: It is made by the calcination method. Heat is given to small pieces made of pre-ground fine powder of pearl. Mukta Pishti is more beneficial as compared to Mukta Bhasma. It has more coolant action and provides good quality of highly absorbable calcium. Mukta Pishti has following healing properties. Mukta Pishti is helpful in following health conditions. Therapeutically, Mukta Pishti helps in bleeding disorders, heartburn, acidity, gastritis, GERD, nosebleed, mental weakness, anxiety, depression, burning sensation in eyes, headache, frequent urination, Cardiomyopathy, insomnia etc. Mukta Pishti is also practicable as natural calcium supplement. Its calcium is highly micro fine and absorbable in the gut. It provides strength to bones, joints and muscles. Calcium plays a vital role for optimum functioning of cells, muscle cells, nerves and bones. Therefore, Mukta Pishti provides support in important vital functions in the human body. Let us discuss about the important health benefits and medicinal uses of Mukta Pishti (Pearl Calcium). According to ayurveda, three humors play a role in every disease. It is same for mental disorders. Mukta Pishti works when there is PITTA aggravation. The symptoms of PITTA aggravation are as follows. If anybody has any of above symptom, then Mukta Pishti is a drug of choice for him for curing the stress disorders or depression. In depression with PITTA symptoms, the following combination of herbal powders is beneficial. We have also observed Mukta Pishti reduces anger and irritability in most of patients. We treat anger with following remedies. We simply treat the excess PITTA humor, which ultimately reduces habit of becoming angry and mental irritability. The former name of Somatic Symptom Disorder is Somatoform Disorder. Patients complain about the unexplained pain, which has no findable physical cause. This disorder is chronic and long-term condition. Many body parts are involved in this disease. If following symptoms are present, then Mukta Pishti will be the ayurvedic treatment for Somatic Symptom Disorder. Mukta Pishti is a drug of choice for heartburn and acidity. It neutralizes the excess acid in the stomach and provides immediate relief from acidity and heartburn. It also improves digestion and reduces indigestion caused by excess acid in the stomach. However, it may not work if indigestion is linked with KAPHA symptoms like fullness during or after having meal, white tongue etc. Mukta Pishti has anti-inflammatory effects, which are more visible on gastric mucosa (lining of the stomach). There may be many causes of gastritis including infection, ulcer, injury, alcohol, etc. Mukta Pishti gives relief from gastritis of any underlying cause. Mukta Pishti helps in both types – acute and chronic gastritis. It gives quick relief from symptoms like burning ache, nausea and feeling of fullness in upper abdomen. Mukta Pishti has NO SIDE EFFECTS & LIKELY SAFE. It does not cause any gastric irritation, abdominal discomfort, belching or gas like modern calcium carbonate supplements. It is derived from natural source, so it is natural calcium. Processing it with rose water make it more gentler and micro fine, which becomes highly absorbable in the body and highly effective in all diseases in which it is therapeutically indicated. Mukta Pishti has reported to be highly tolerated without any unwanted effects in most of patients. No patient has complained about anything wrong occurred with Mukta Pishti. Mukta Pishti is good natural calcium for pregnant and lactating women. It is LIKELY SAFE and WELL TOLERABLE in pregnancy. Who should not take Mukta Pishti (Pearl Calcium)? If you have any of the following diseases, then you should consult ayurvedic doctor before starting Mukta Pishti. In the book Principles and Practice of Ayurvedic Medicine by Prof. Dr. SRINIVASULU, he has recommended for avascular necrosis Brihat Vatchintamani Ras 125 mg + Kamdudha ras with Mukta 125 mg. I can understand that Brihat Vatchintamani Ras will help flowing blood to the affected area in this disease. But I could not understand the function of Kamdudha ras with kukat’s functions. Does it help to increase bone strength as it contains Praval, Mukta, Shankh etc., which all are natural calcium. Could you explain it further please! Actually, in avascular necrosis or osteonecrosis, VATA and PITTA both play a crucial role in development of the disease. Although VATA is main cause, but necrosis of any organ cannot occur in the body without PITTA involvement. This is basic ayurvedic principle. VATA is dominant factor and PITTA is secondary responsible factor for osteonecrosis and conditions like hair fall, aging, etc. However, Brihat Vatchintamani Ras can work alone because it works on both VATA and PITTA. To potentiate its function, Kamdhudha Ras is used as supportive therapy. According to Modern concept, Calcium and mineral supplement is also important component to prevent further damage to bones and re-build the bones. So the same osteoporosis treatment is also advised in this disease. However, I believe in affordable treatment that consists of Abhrak Bhasma, Mukta Pishti, Hadjod, Parwal, shankh, Jasad Bhasma, Amalaki Rasayana etc. All these remedies improve blood circulation and prevent bone damage. The combination is more effective than any individual remedy. Great article, Dr. Singh! I am looking for the best medicines to control my Pitta, and this is extremely useful. Thank you so much for all the work you do to promote the great science of Ayurveda, and to provide such good information. Very well explained article… now i know why i have these many problems. All because of PITTA. A patient with low blood pressure can take it. Does it causes constipation. My wife 13 week pregnant. Doctor prescribed Calcium tablets. After taking calcium tablets, my wife feels severe pain and gas in the abdomen. A friend suggested me to take 3 grams Moti Pishti and 5 grams Praval Pishti and make 40 doses. After taking this, there is no problem. Can we continue this medicine for 9 months for calcium requirement? Is it sufficient dosage for calcium requirement in pregnancy? For iron, we are taking Lohasav 2 times daily 4 teaspoons. Your wife should take it twice daily.